Session at JavaOne come in various shapes. Some are visionary, high level and future oriented. Others are detailed and discuss practical, sometimes very fine grained topics. One of the sessions I attended was somewhere in between: future oriented yet pretty concrete at the same time. It was probably my favorite session at JavaOne this year: What’s new in Servlet3.1: An Overview by Shing Wai Cha and Rajiv Mordani. The passion of the presenters – their enthusiasm to explain the current development of the Servlet API and their ability to demonstrate some rather tough concepts were pivotal. Many presenters can take their style as an example they can learn from. 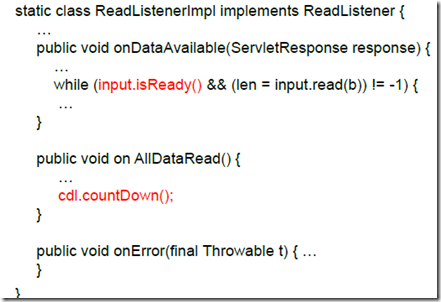 The Servlet 3.1 API is part of the JEE 7 edition- that is scheduled for complete release in April 2013. The Servlet Specification is largely complete, although some elements are still under discussion as became clear during this talk. The probably most important new requirement in Servlet 3.1 is the ability to do Web Socket interaction. Web Sockets is a relatively new communication protocol that runs over TCP/IP and goes beyond HTTP in several respects. Web Sockets support bi-directional interactions (open channels through which both participating parties can send messages) with low overhead (no HTTP headers involved for example). Web Sockets is the main driver behind server push to client. Note: even today, Java Web Applications can incorporate Web Sockets through various frameworks, both open source and commercial. See for example: https://technology.amis.nl/2012/01/15/stand-alone-java-client-for-jwebsocket-server-communicating-from-java-client-to-web-clients-and-vice-versa-over-websockets/. Shing and Rajiv did a good job of explaining how Web Socket support is added to Servlets, building on top of the work in the 3.0 specification (JEE 6) on asynchronous processing (see for example https://blogs.oracle.com/enterprisetechtips/entry/asynchronous_support_in_servlet_3 by Rajiv Mordani). Basically this support meant that processing a request could be delegated to an Asynchronous job that would not hold on to the thread until the response could be completed. Through the Asynchronous support, Servlet Containers can handle a larger load of requests (that receive somewhat delayed responses from back end services such as databases or web services). Servlet 3.1 adds to this support in several ways. The end result is that Servlet 3.1 can upgrade an HTTP request to the Web Socket protocol. 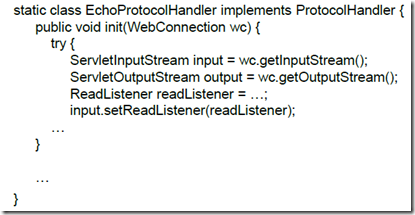 This establishes a channel on which both the client and the server can publish messages. Listeners on both ends are activated when a message from the other end of the channel arrives. When there is no communication over the channel – no threads are active. Not only do we get server to client push, we also get it in a scalable, non-resource intensive way. And we hook into the client Web Socket support in browsers or in other clients. As Web Sockets are supported in many programming languages, they also provide a ‘channel’ between Java and .NET, PHP or Ruby. The CountDownLatch (see http://www.javamex.com/tutorials/threads/CountDownLatch.shtml) is used to bring the thread into a form of hibernation: it waits, does nothing and holds (virtually) no resources. 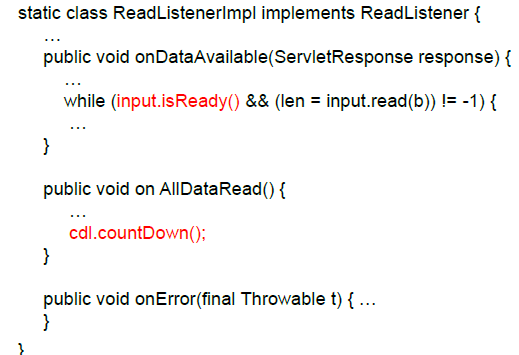 This state is entered if the initial reading of the input cannot complete because at some point the input.isReady() method returns false – meaning that there is currently no data to be read. 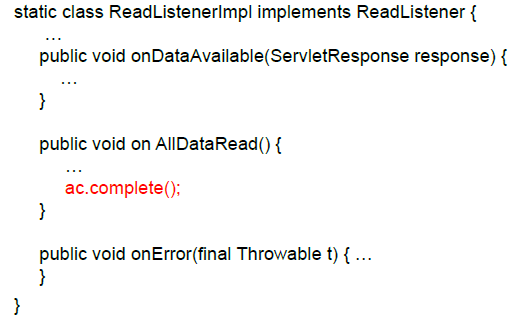 As soon as more data is available on the input, the ReadListener will have to take over and continue processing. It contains the onDataAvailable method that is invoked whenever the container has more data on the input to be processed. When all data is fed into the listener, the container will tell the listener about that facts by invoking the onAllDataRead method. In this case, the thread that was hibernated in the Servlet itself is released through the call to countDown(). 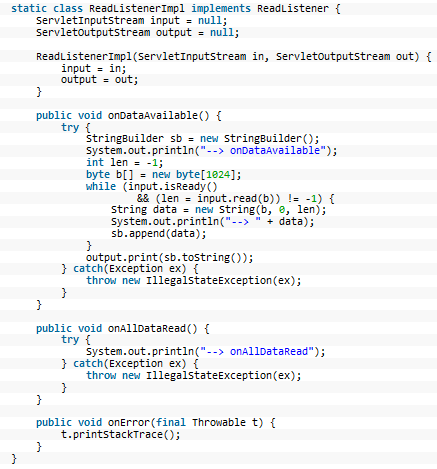 Something similar applies to write part of the Servlet: if for some reason the output that has to be written cannot be written all at once – we can make use of a WriteListener that is invoked by the container whenever the output stream is available for additional writing. When we move into Web Socket territory, we take the next step. This is where the fun really starts. 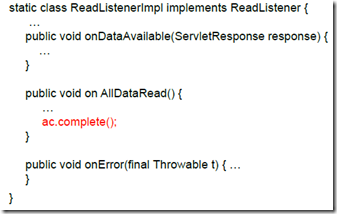 Note that the servlet will step out of the interaction after doing the upgrade. It leaves it to the ProtocolHandler to take the conversation with the client over. 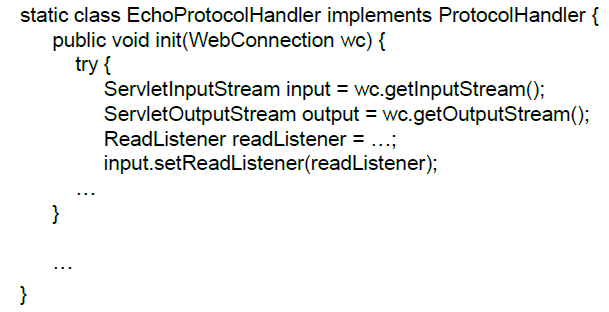 The Servlet only speaks HTTP and the ProtocolHandler in this case can do Web Sockets. It is initialized with a WebConnection from which it can also retrieve the HttpSession context. During initialization, it will typically set up a ReadListener to receive and process any data that arrives on the just established Web Socket channel. Any time data comes in, the onDataAvailable method is invoked by the container. Processing takes place – the data is read and combined in a StringBuilder objects whose content is subsequently written to the output. In a more serious application, some form of processing would take place on the input – for example retrieving data from a database or web service based on the parameters sent over the Web Socket channel – and the results would be written to the output, possibly in more than one go through the use of a WriteListener. With the latest promoted GlassFish build, it is already possible to build and test examples of using the Web Socket support in Servlet 3.1 API. Download the presentation from the JavaOne Content Catalog. 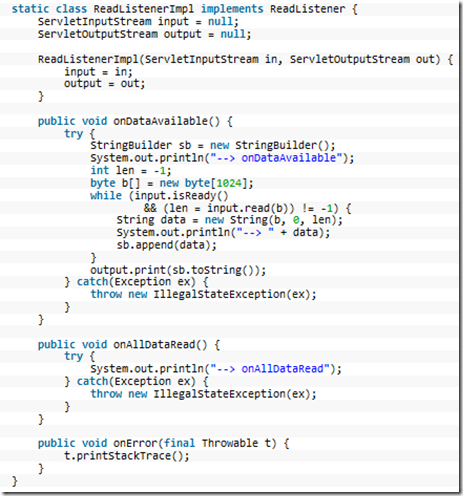 JavaOne 2012: Any news on the Java Caching Standard (JSR 107)?